Artist Performance Sets 1-7 are all included in the UltraPAK and Audiophile Edition. With Artist Performance Set 8, you’ll be delighted to hear eight well known folk songs, sung in beautiful harmony by professional singer, Béatrix Méthé. These songs date back over hundreds of years, and are popular all over the world. You are sure to recognize more than a few, with origins spanning America, Ireland, Canada, and France. 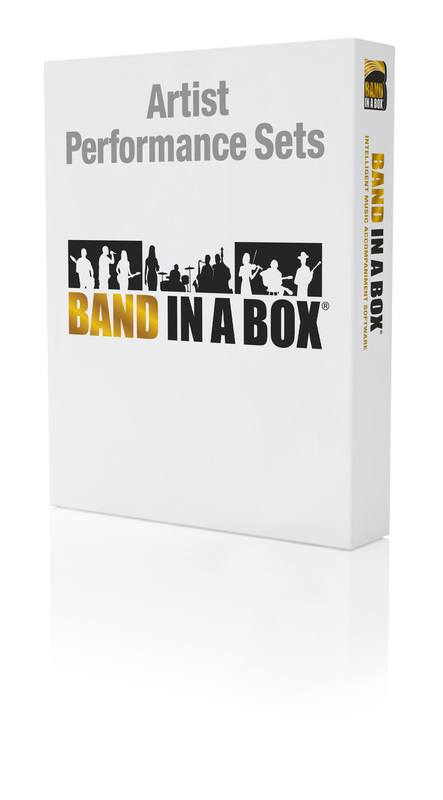 Each song has a hand picked Band-in-a-Box style, with the lyrics and singing professionally transcribed, so you can use the notation window, tempo stretching, and all the other Band-in-a-Box features to make sure you’re well-versed in each song. In addition to the melody, each song has one, or even two harmony parts sung by Béatrix! We hope you will enjoy listening and learning each of these timeless songs. "À la claire fontaine" is a traditional French song which dates back to the early 17th century. The title translates to “By the clear fountain” and is about a long lost lover of the singer. The song has become popular in French speaking communities in Canada, like Quebec, which is where this singer (Béatrix Méthé) is from. It is sung here by Béatrix in her native language of French, and in the key of C major. You may notice that the song doesn’t stick to 4/4 time. That is because there are 3 bars of 3/4 time during bars 4,5, and 7. Some musicians like to call songs like these “crooked” because they don’t have a consistent or predictable number of beats each measure. The 8 bar form repeats 5 times with a high harmony coming in for the final section. "Amazing Grace" is a Christian hymn published in the Olney Hymns book in 1779. The words are written by English poet John Newton (1725–1807), however the author of its last section, with the words; “When we’ve been there…” is unknown. It was later put to William Walker’s tune called “New Britain” in 1835, but to confuse matters, earlier versions of the same tune exist by different writers. That being said, this song is one of the most recognizable songs in the English speaking world! It is sung here by Béatrix in the Key of D major. There are 8 sections in the song, with the first and last being the same. Notice that the low harmony is being sung the entire song, and the final section has a great 3-part harmony. The song is a waltz, meaning it’s in 3/4 time, and is being played by a 4-piece bluegrass band in a swing 8ths feel. "Amazing Grace" is a Christian hymn published in the Olney Hymns book in 1779. The words are written by English poet John Newton (1725–1807), however the author of its last section, with the words; “When we’ve been there…” is unknown. It was later put to William Walker’s tune called “New Britain” in 1835, but to confuse matters, earlier versions of the same tune exist by different writers. That being said, this song is one of the most recognizable songs in the English speaking world! It is sung here by Béatrix in the Key of D major. There are 8 sections in the song, with the first and last being the same. Notice that the low harmony is being sung the entire song, and the final section has a 3-part harmony. This version is a waltz, and is played in an even 8ths feel. The trio consists of bass, guitar, and a drummer playing with brushes. “Danny Boy” was born when Frederic Edward Weatherly (1848-1929) set words to the ancient Irish tune of "Londonderry Air" in 1913. It’s unknown who wrote the tune “Londonderry Air”, because it’s likely over 300 years old. Believe it or not, Frederic Weatherly wrote lyrics to more than 3000 songs and was also a practicing English lawyer! It is sung here by Béatrix in the key of A major. There are 4 sections in the song, and the form repeats once like a typical ABAB format. There is a low harmony that comes in during the B sections, and if you listen closely, you’ll also hear a few notes with full 3-part harmony just as the song is ending. The 5-piece band features bass, piano, drums, guitar, and a cello. "Down by the Salley Gardens" is a William Butler Yeats poem that has been set to a traditional Irish air. It was published in Yeats’ book, The Wanderings of Oisin and Other Poems in 1889. Here it is sung by Béatrix in the key of A major. There is a quick intro that lasts 4 measures, then the singing begins on bar 5. Each stanza that Yeats wrote symbolizes an A and B section in Band-in-a-Box, which gets repeated once for the two stanzas. The B section has a nice chord change to the D chord (The IV chord in the key of A) which helps the song move along nicely. Of course you can change any of the chords around, as there are no real set in stone chord changes for these traditional songs. You’ll notice that there is a high harmony line that happens during bars 13-16, but other than that the melody is all the song needs to sound great. A 4-piece Celtic band with bass, piano, guitar, and cello backs up the vocal nicely. "Oh My Darling, Clementine" is an old American folk song written by either Percy Montrose or Barker Bradford in 1884. The song may have been based on a song called "Down by the River Liv'd a Maiden" by H. S. Thompson in 1863, but there is little evidence of this. The song is commonly sung by children, even though the lyrics are dark, telling a story about a miner and his daughter drowning. It is sung here by Béatrix in the key of C major. There are 5 verses and choruses, with 3 part harmony on each chorus. It’s a simple song harmonically with only 2 different chords. The band includes bass, drums, guitar, and features a resonator that plays fancy background lines. "Oh Shenandoah" is an old American folk song, dating back to the early 19th century. The writers of the song and lyrics are unknown, but they were likely voyageurs or fur traders traveling down the Missouri River in canoes, as the lyrics suggest. It is sung here by Béatrix in the key of C major. There is a 4 measure intro, then the singing begins on bar 5. During measures 11-14, a low harmony with the words; “Away, I'm bound away, 'Cross the wide Missouri” finishes off each verse nicely. The fifth and final verse of the song ends with a beautiful 3-part harmony. The Celtic sounding band includes a bowed acoustic bass, piano and guitar. "Star of the County Down" is an Irish folk song set in Banbridge town in County Down, in Northern Ireland. The words are by Cathal McGarvey (1866–1927), though it’s unknown who wrote the melody. It is sung here by Béatrix in the key of D minor. There are 3 verses and choruses, with another chorus added at the end. A low harmony is sung each chorus and a 2 measure gap transitions well into the next verse. The baritone guitar and the drums set add some rock n’ roll to this folk song. "The Cherry Tree Carol" is a popular Christmas carol and is also Child ballad number 54 in Francis James Child’s (1825-1896) book, English and Scottish Popular Ballads. The song itself is very old, reportedly dating back to the early 15th century. It is sung here by Béatrix in the key of D major. The arrangement is very simple, it’s a 13 bar waltz, with 6 verses. The first verse gets repeated one more time at the end, and a simple high harmony is added to the end of each verse, and the first verse is repeated to end the song off. The instruments are playing very simply to compliment the very relaxing song. The instruments include bass, brushes, guitar, and harp.